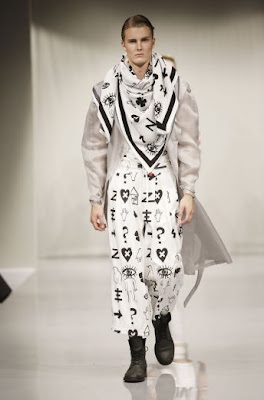 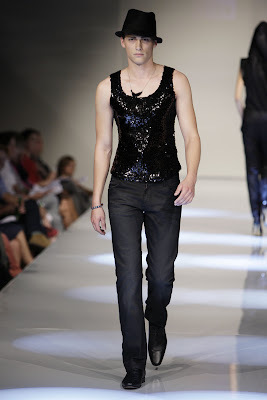 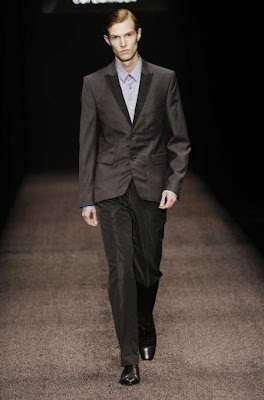 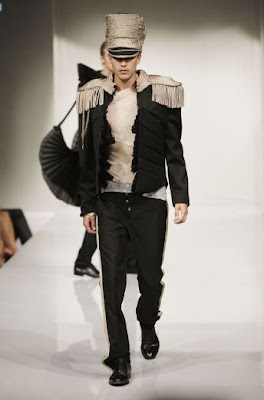 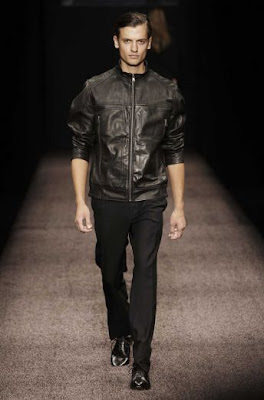 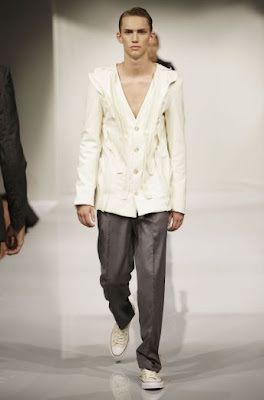 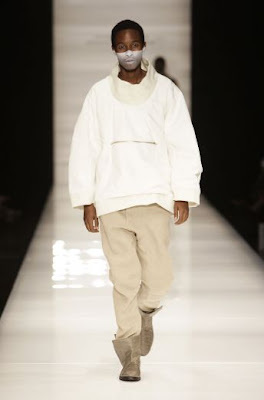 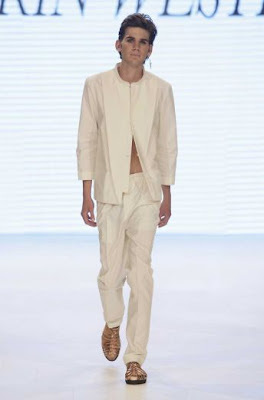 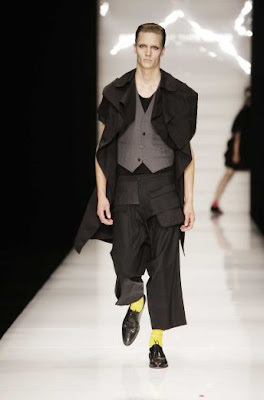 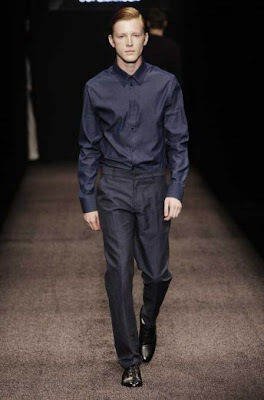 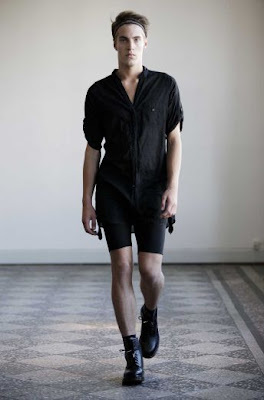 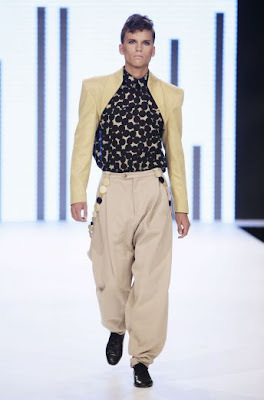 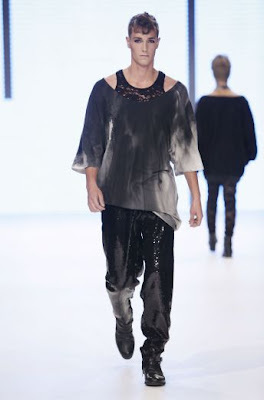 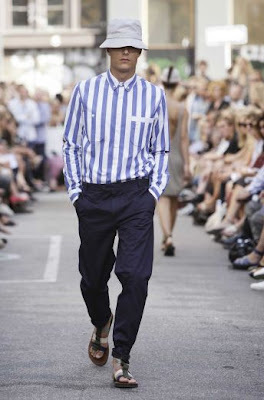 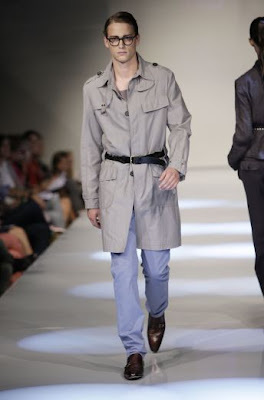 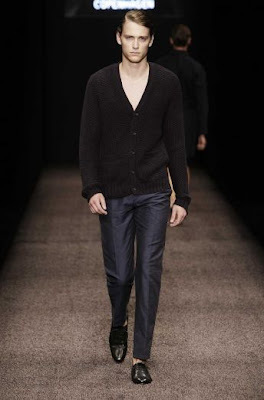 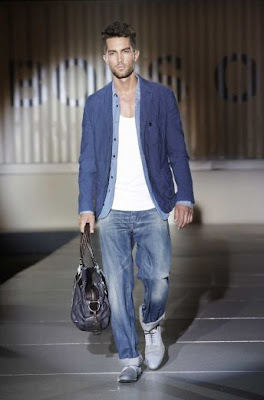 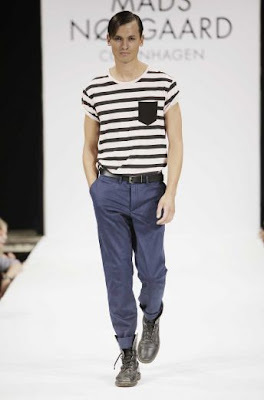 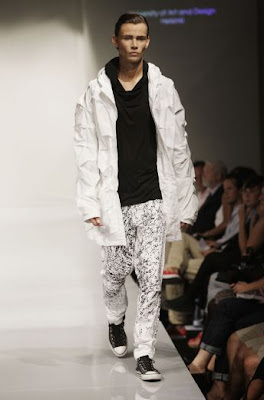 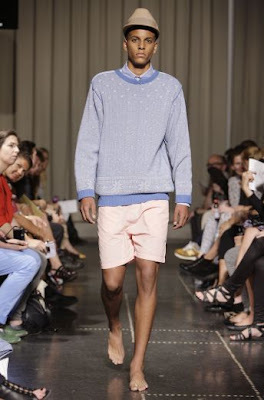 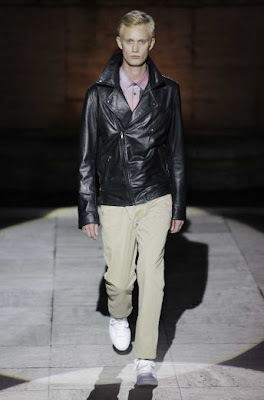 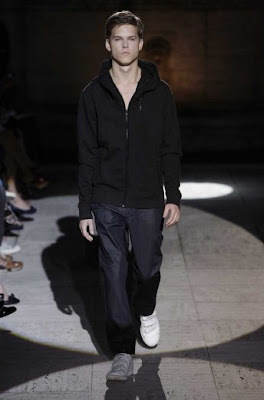 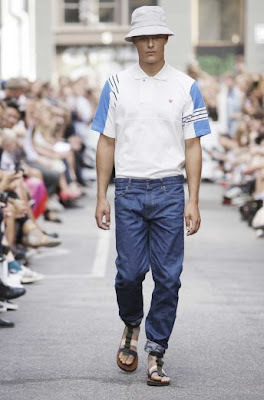 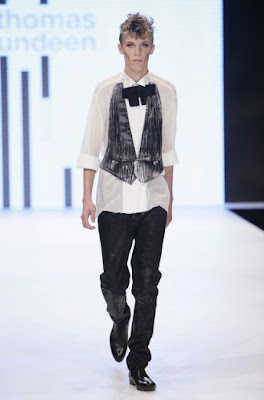 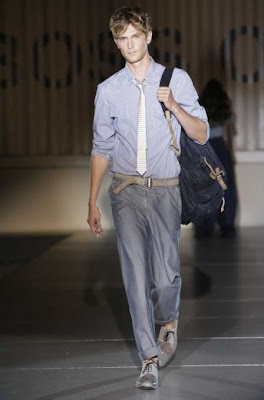 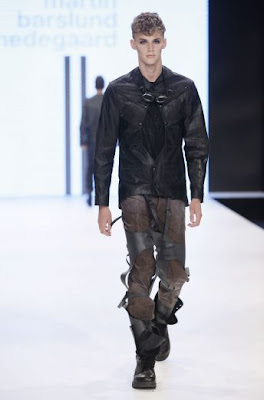 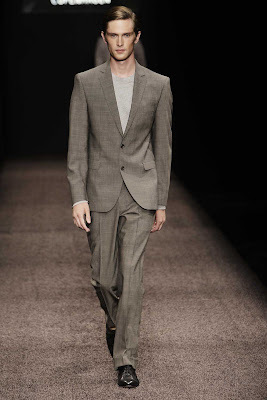 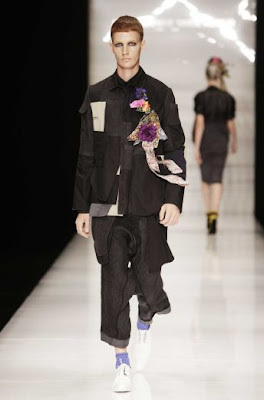 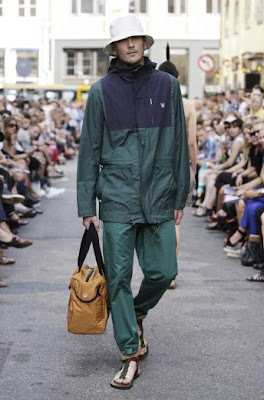 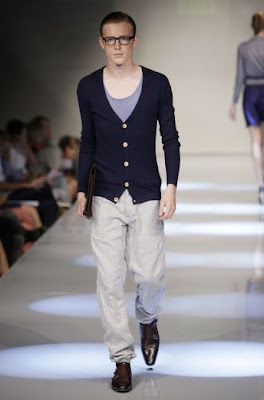 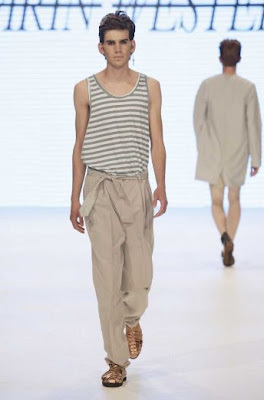 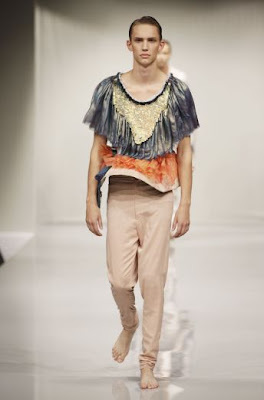 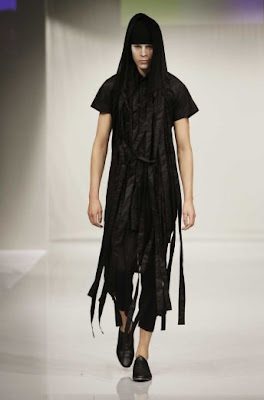 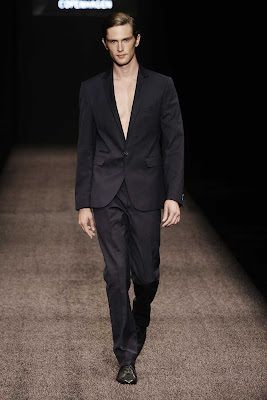 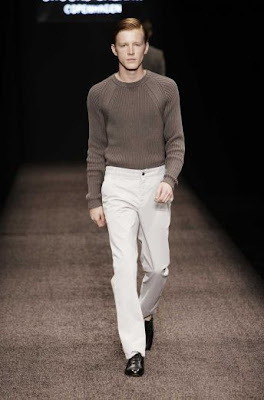 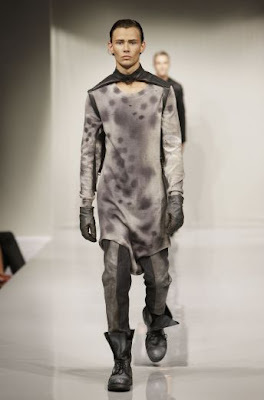 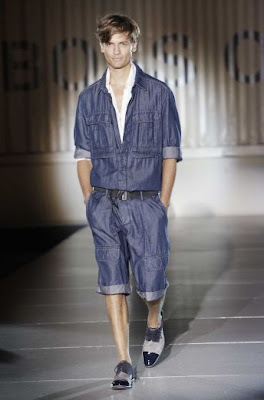 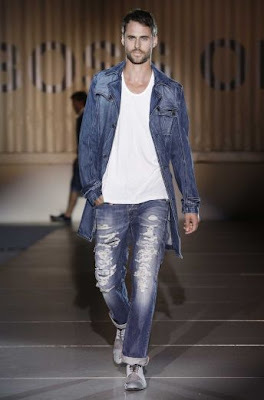 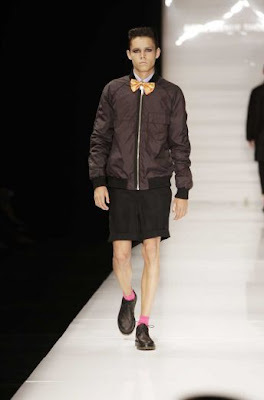 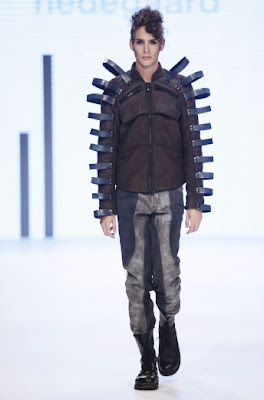 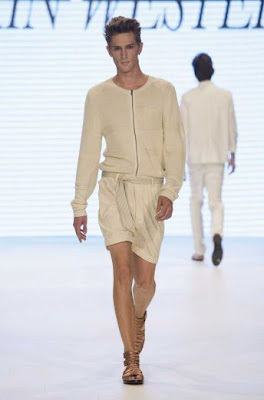 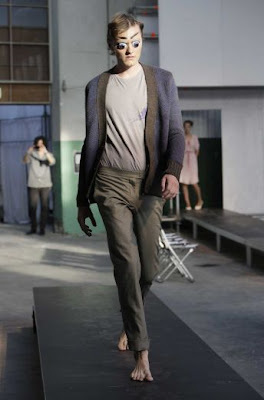 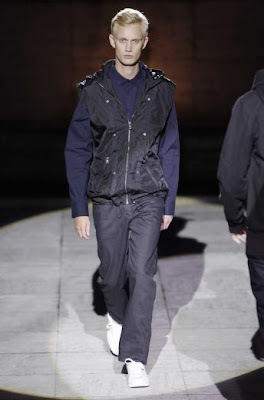 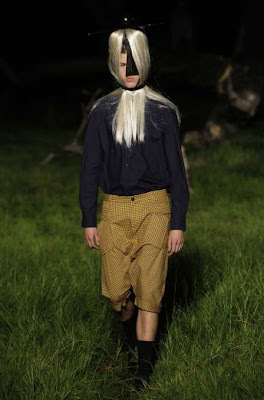 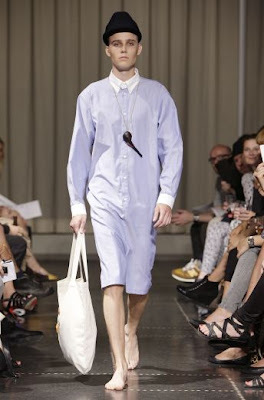 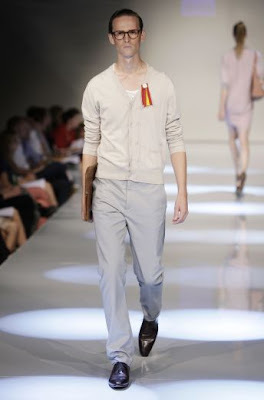 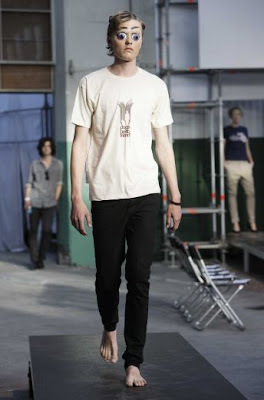 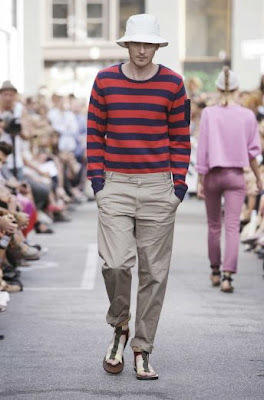 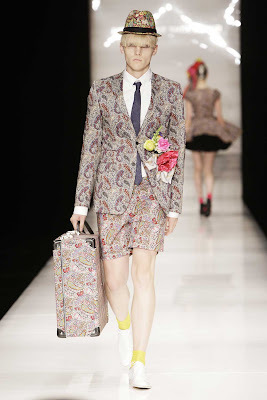 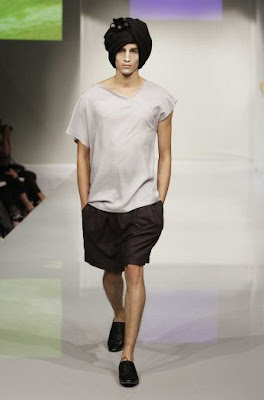 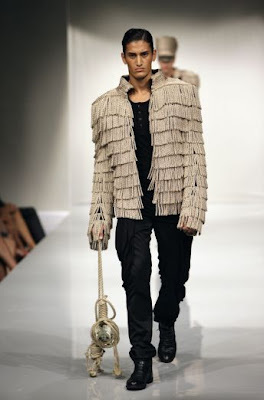 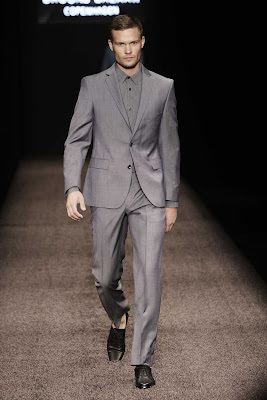 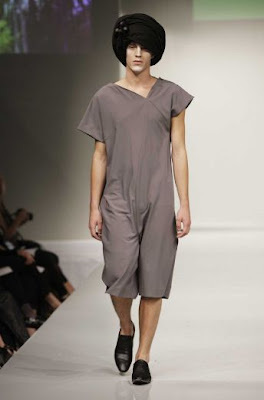 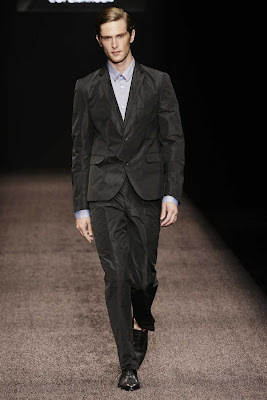 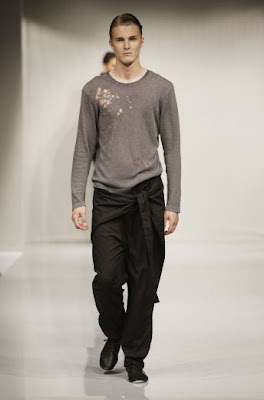 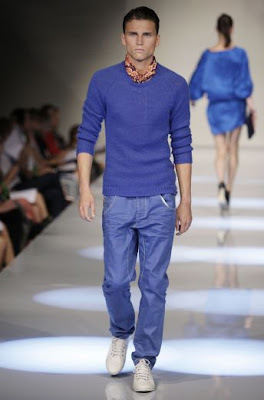 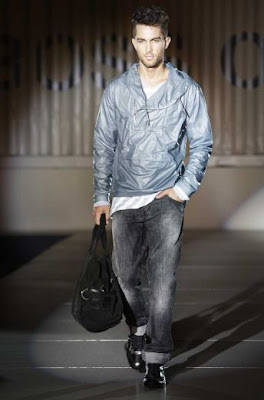 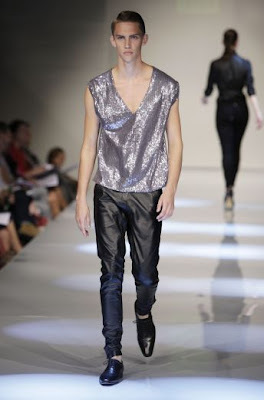 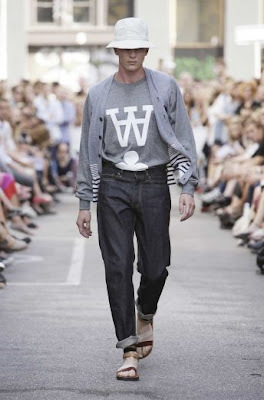 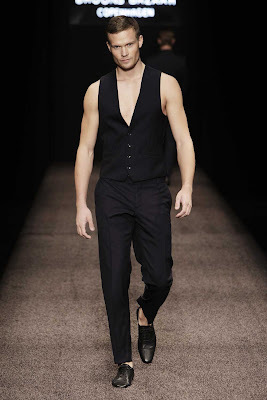 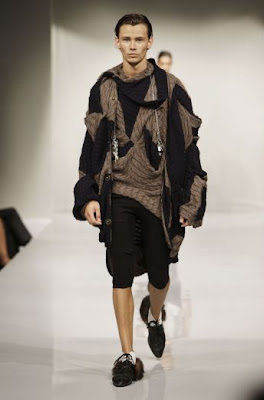 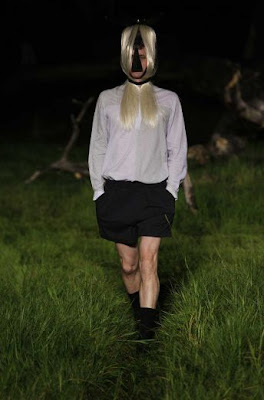 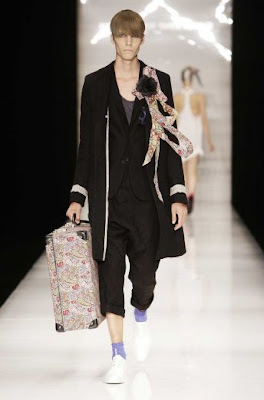 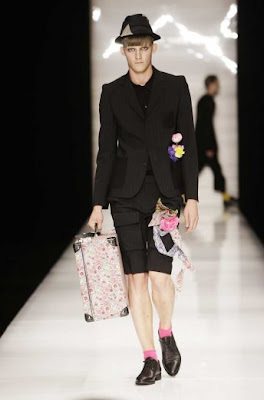 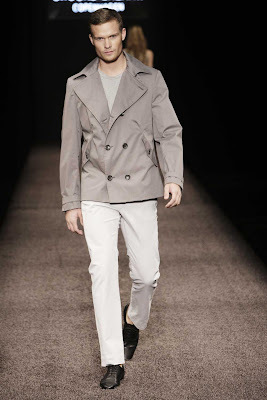 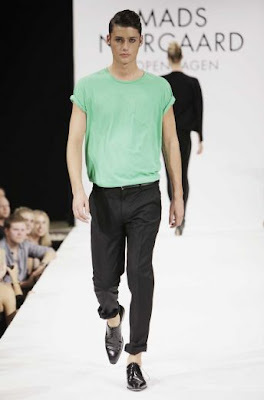 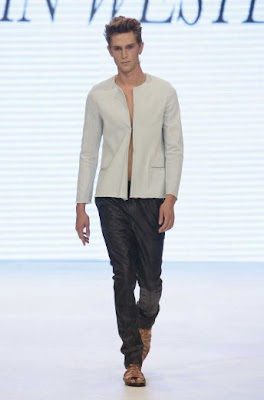 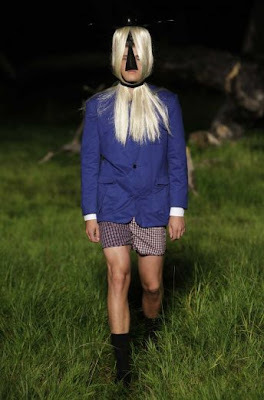 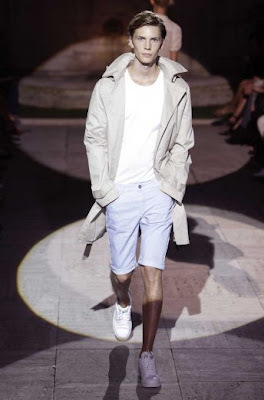 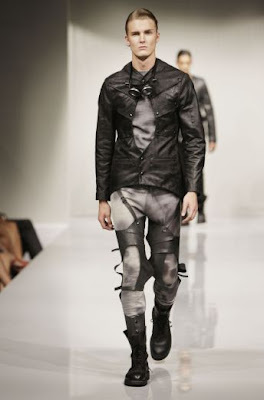 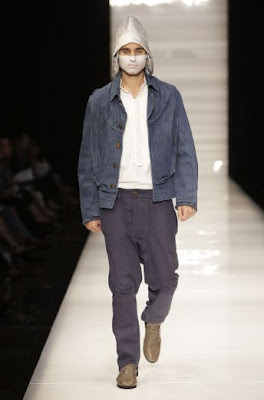 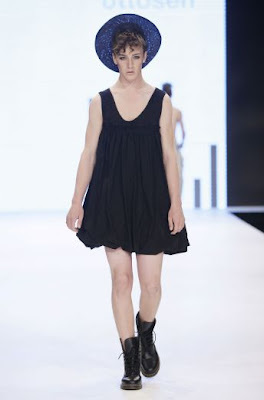 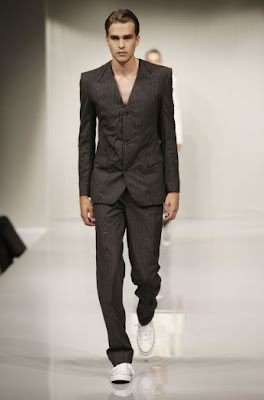 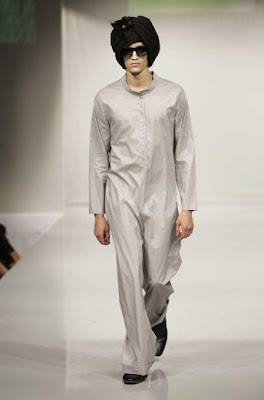 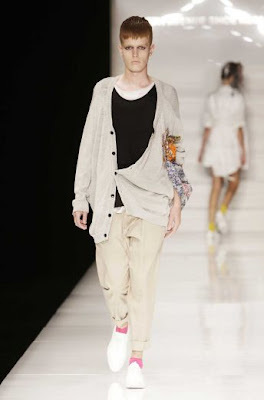 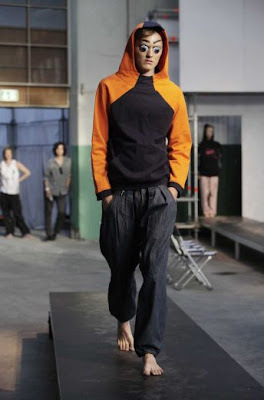 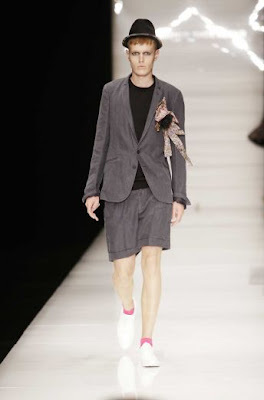 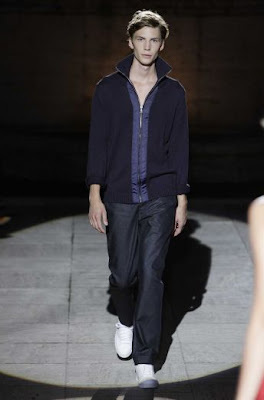 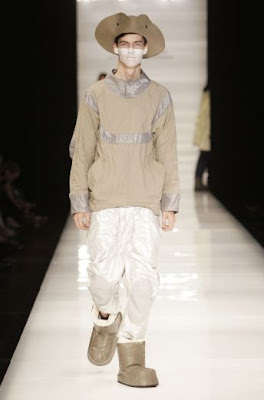 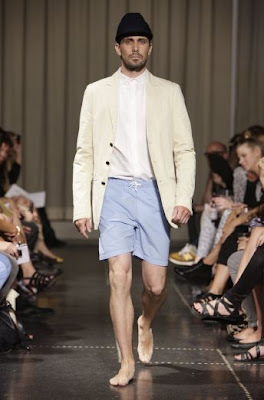 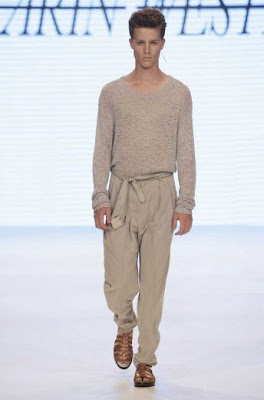 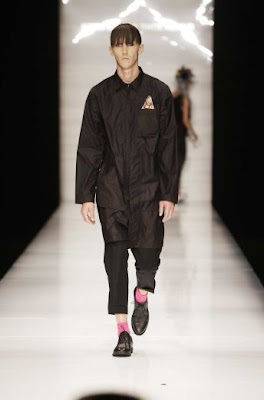 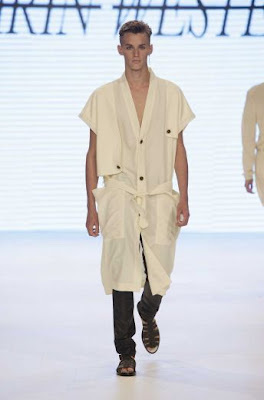 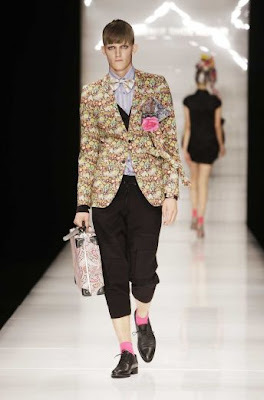 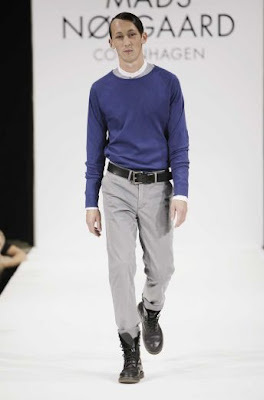 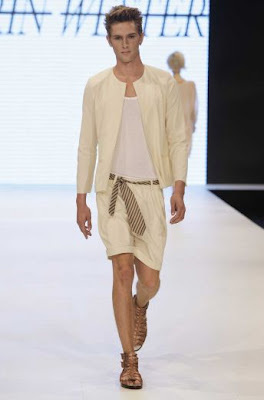 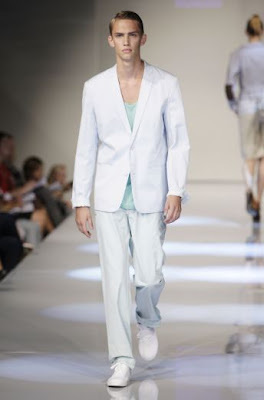 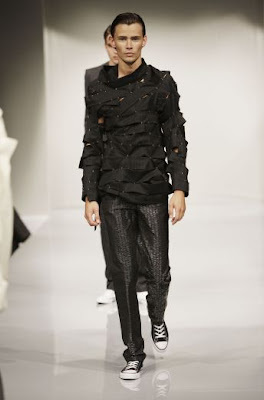 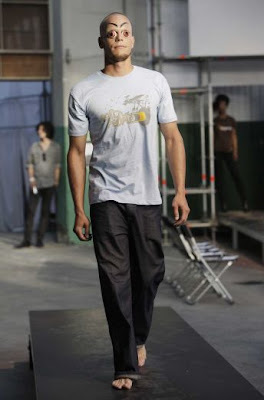 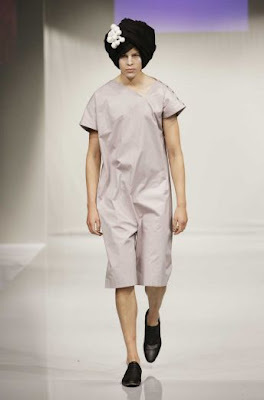 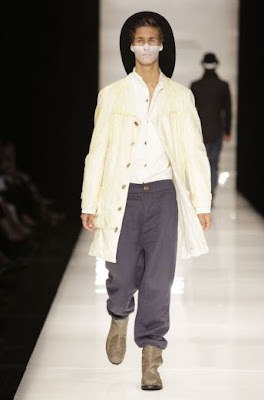 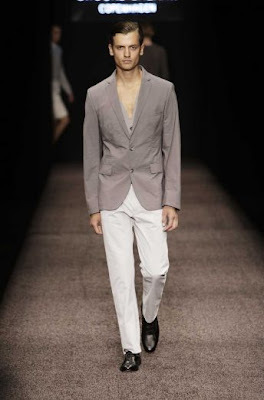 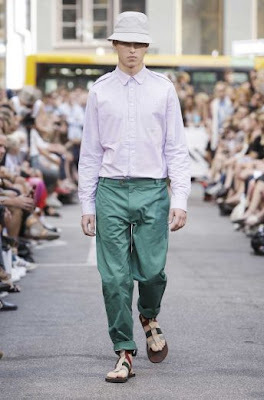 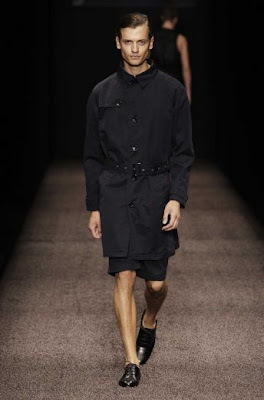 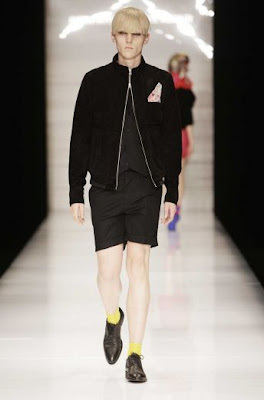 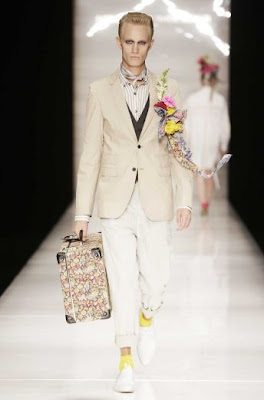 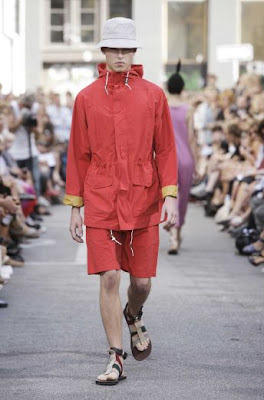 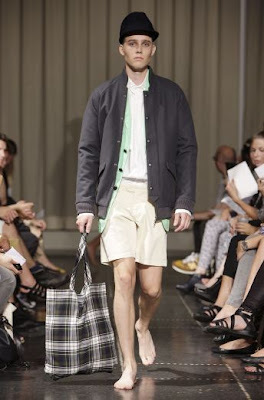 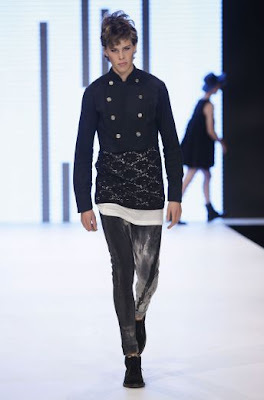 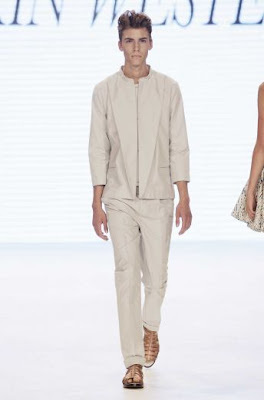 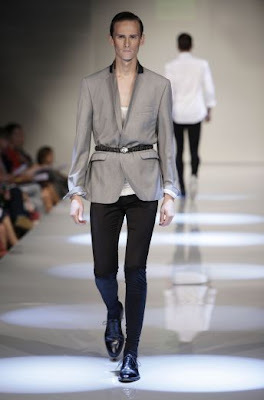 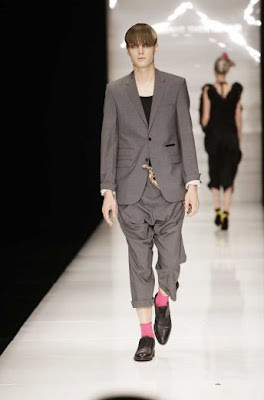 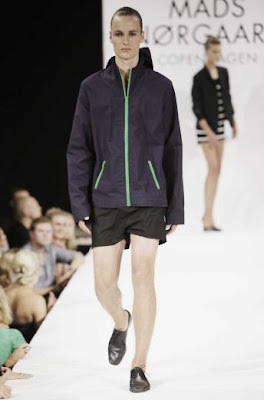 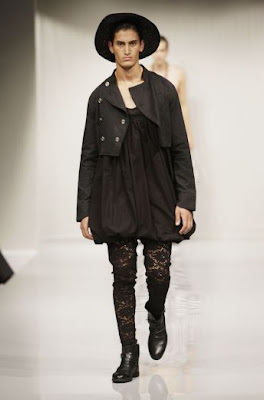 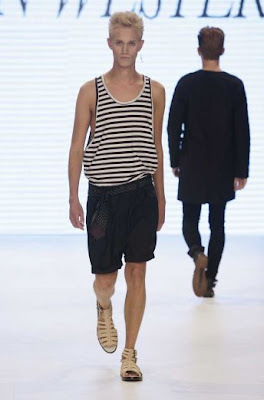 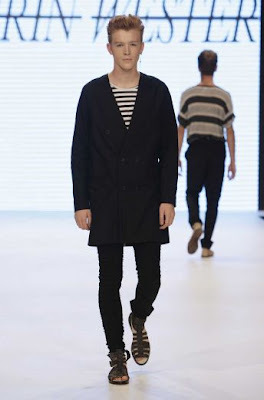 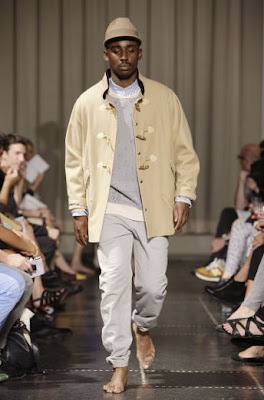 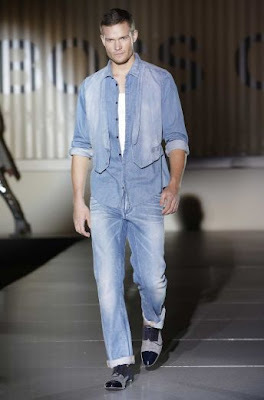 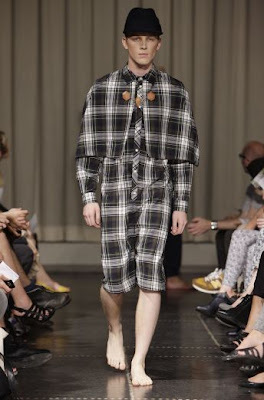 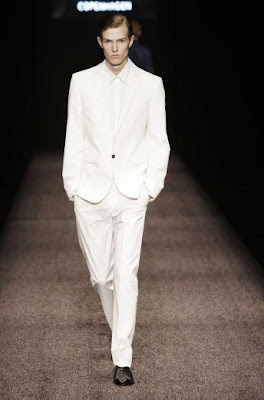 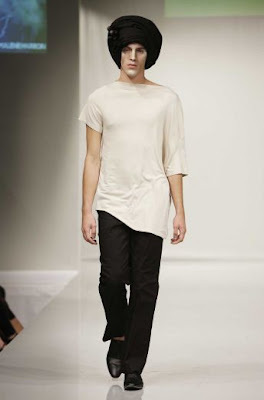 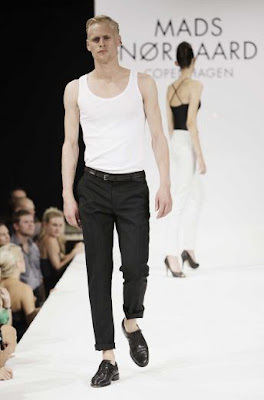 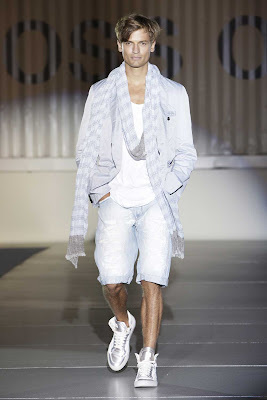 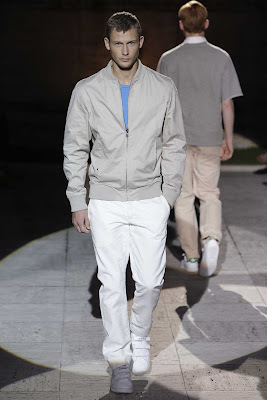 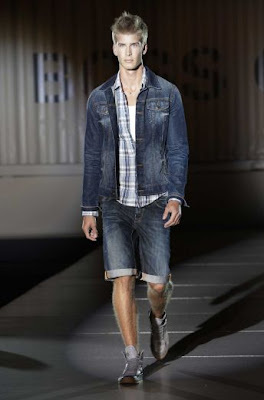 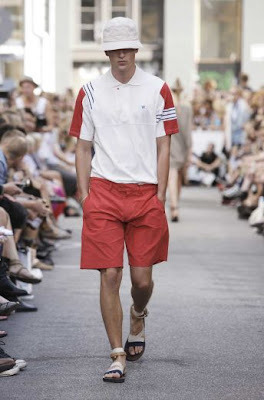 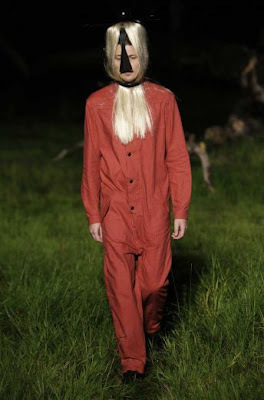 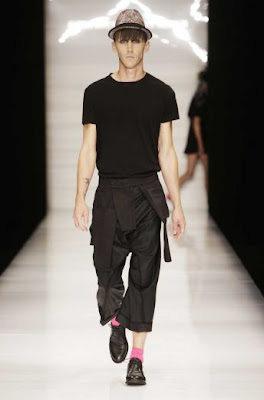 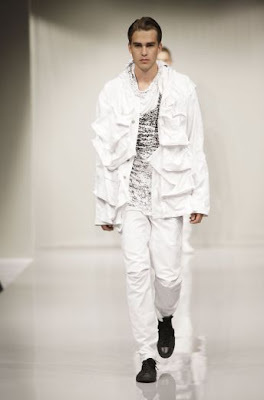 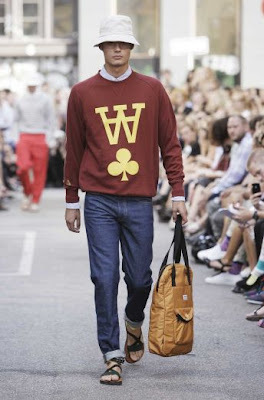 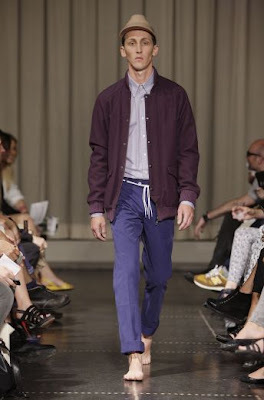 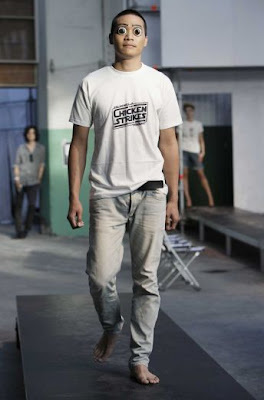 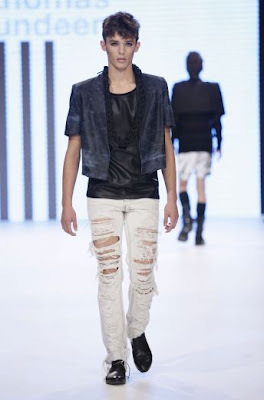 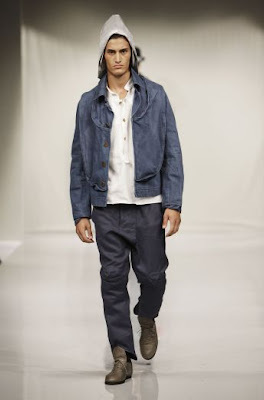 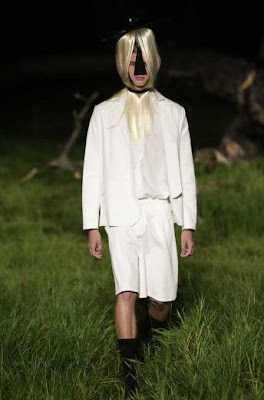 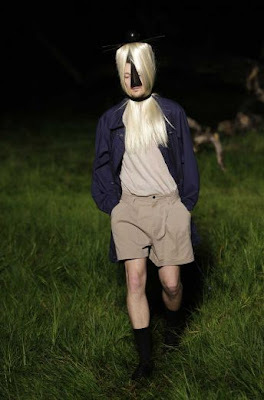 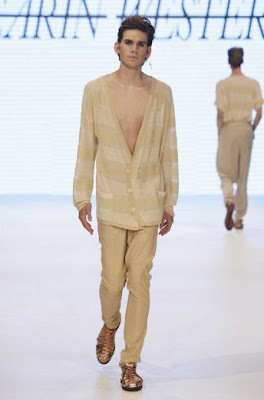 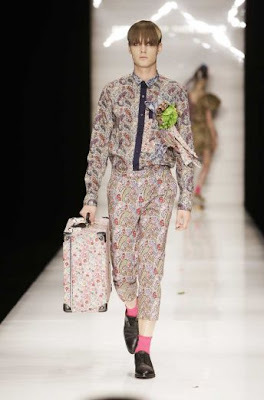 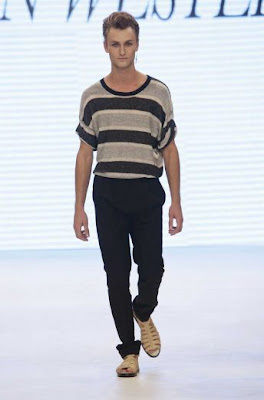 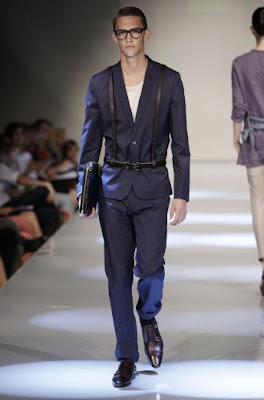 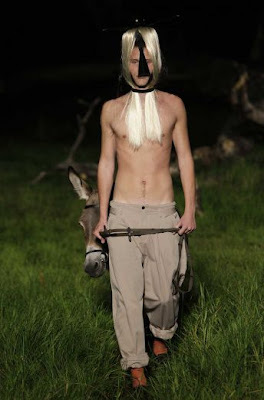 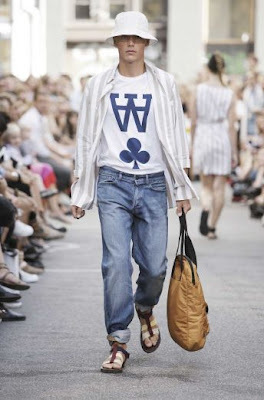 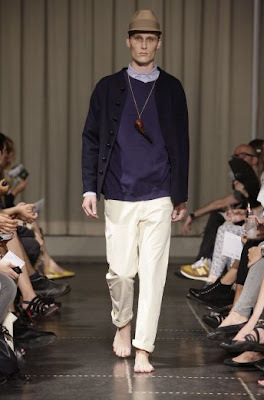 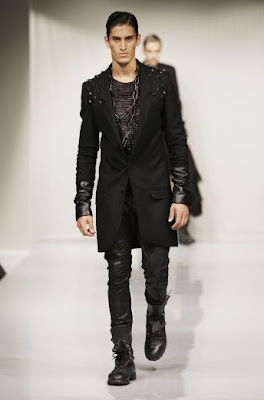 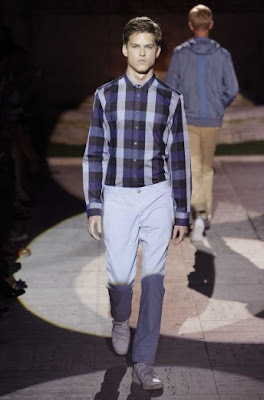 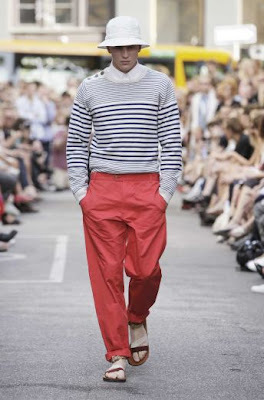 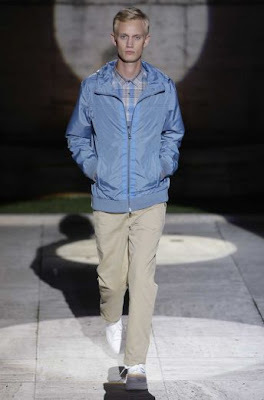 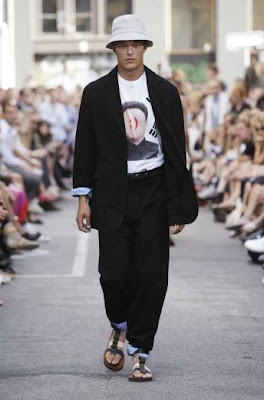 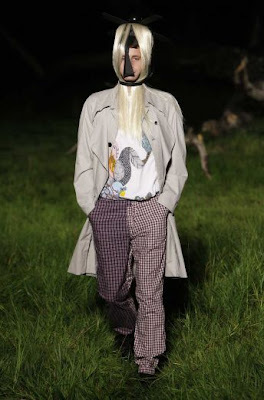 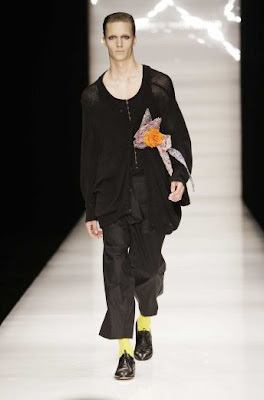 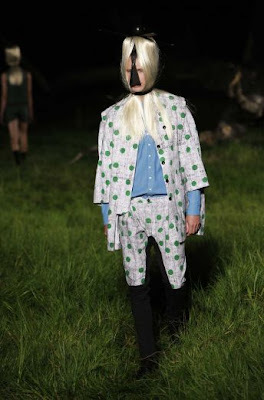 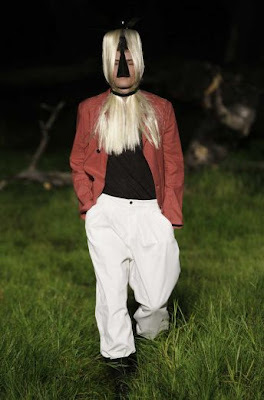 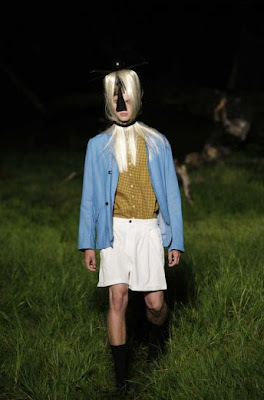 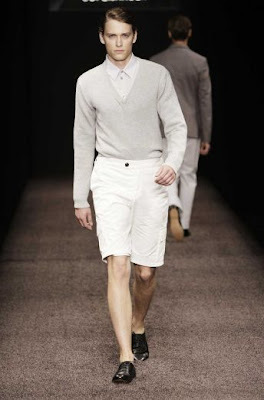 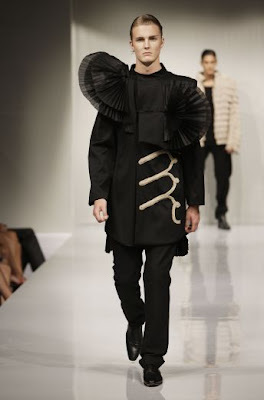 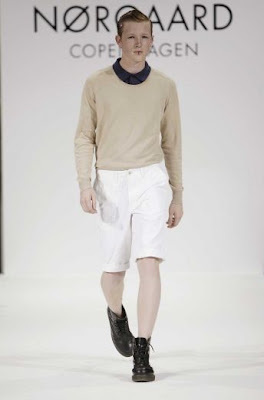 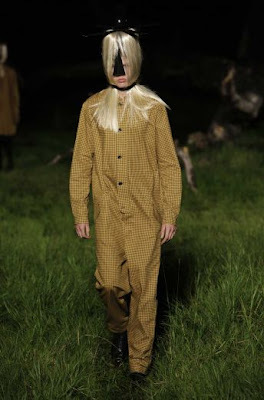 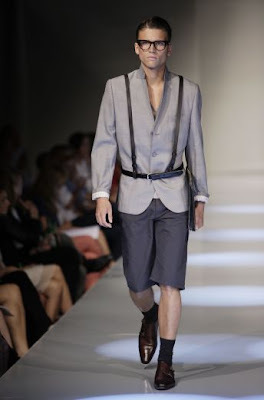 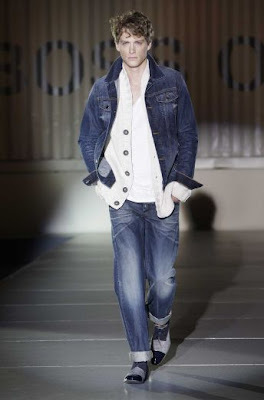 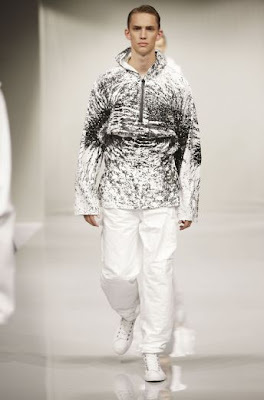 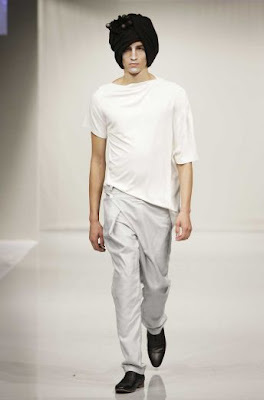 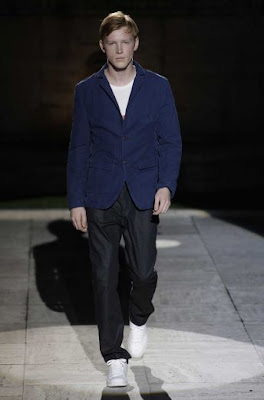 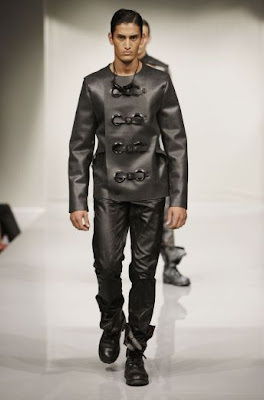 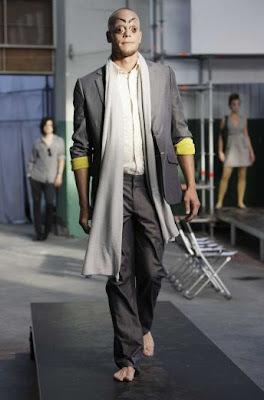 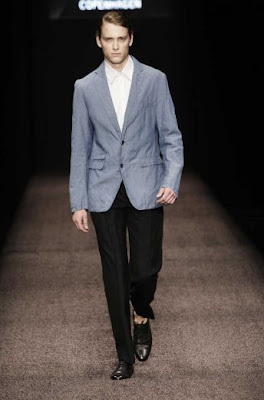 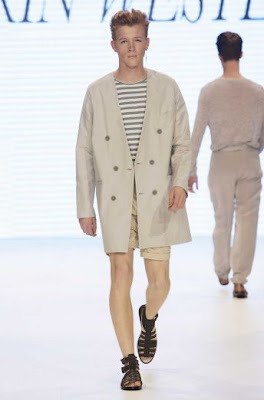 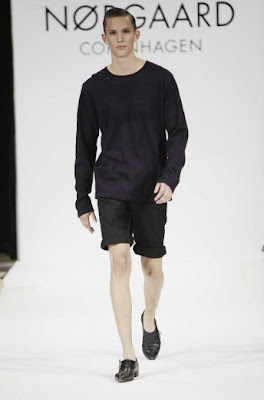 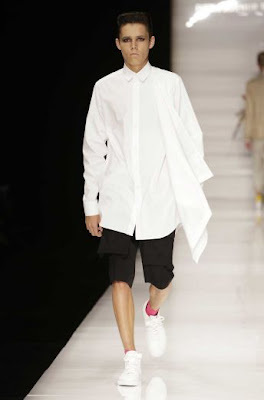 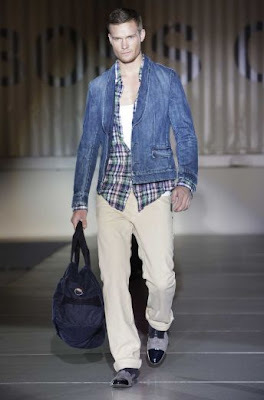 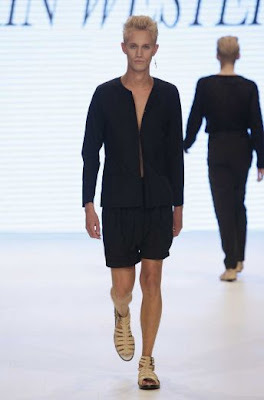 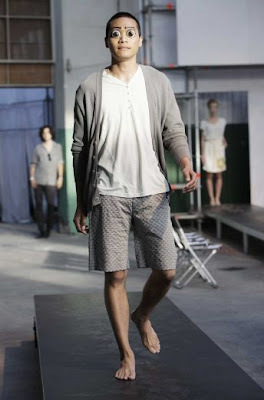 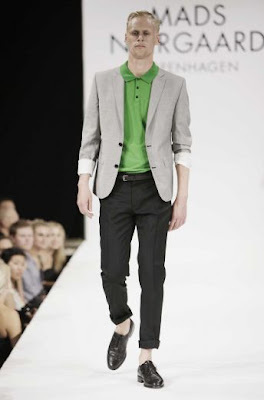 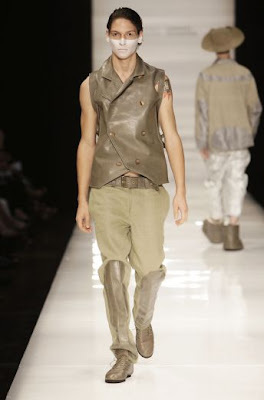 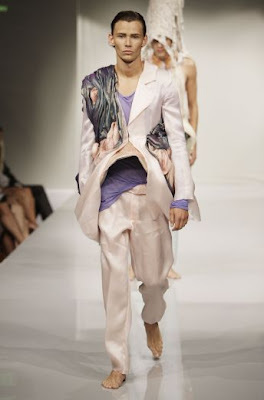 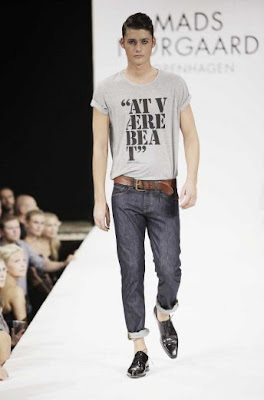 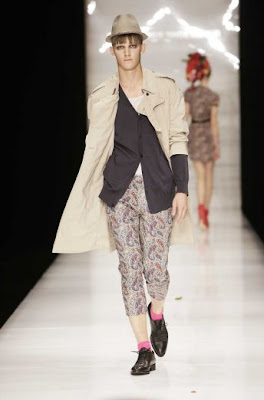 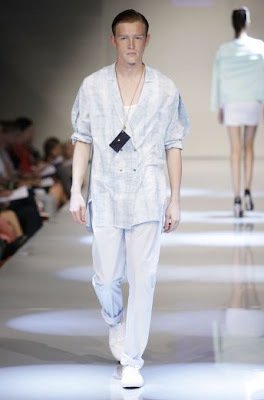 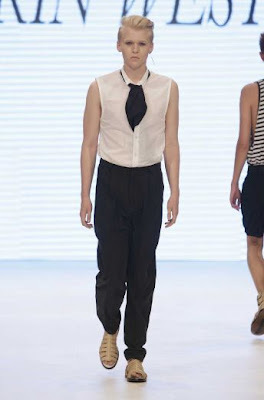 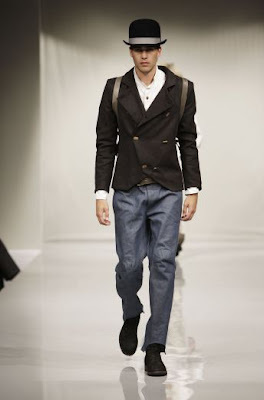 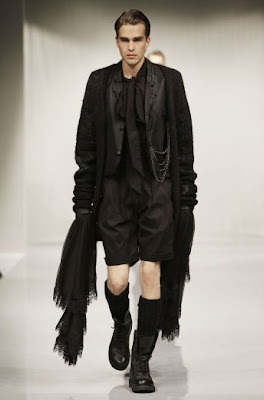 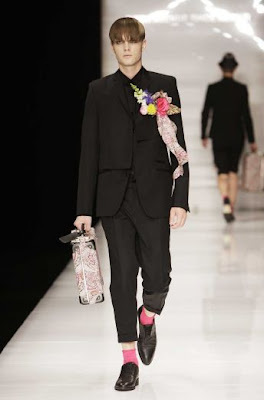 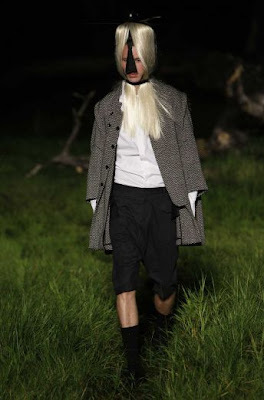 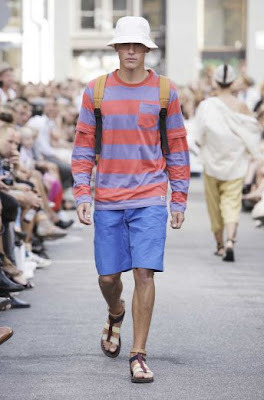 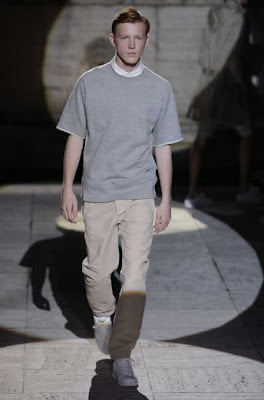 Here are the highlights of men’s spring/summer 2010 collections showed at Copenhagen Fashion Week. 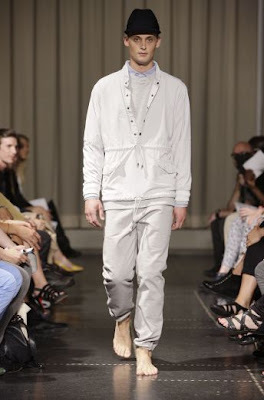 Bjørn and Theis Bruun continued their understated elegance and classic relaxed style for both Bazaar and the diffused line BZR. 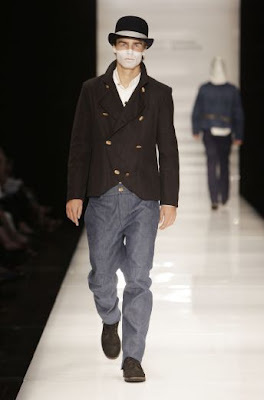 Timeless suits and European version of classic Americana dominated the collection. 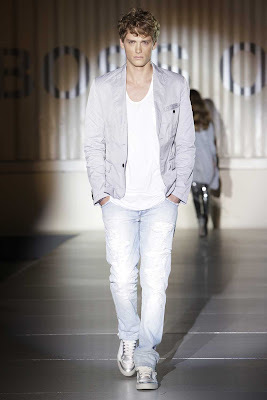 Boss Orange showed a lot of denims. 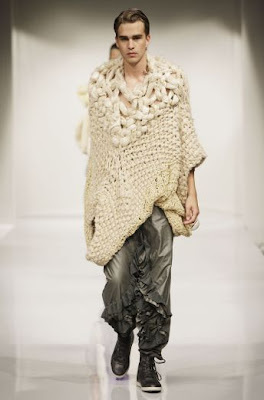 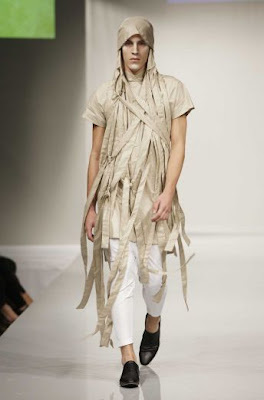 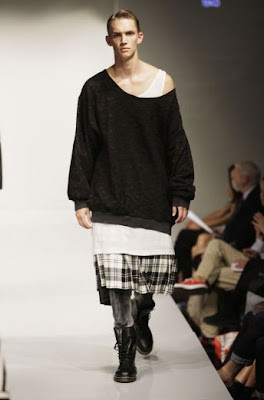 Danish Design Graduates, Designer Nest, Teko students showed a lot of very raw and avant-garde clothes. 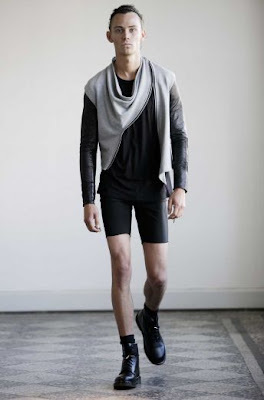 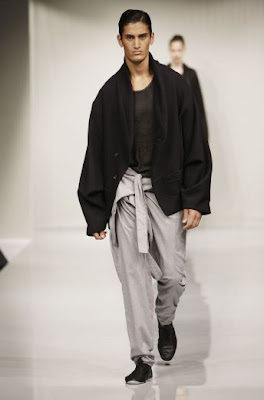 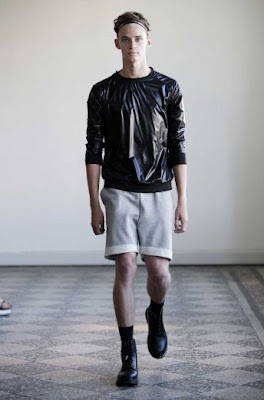 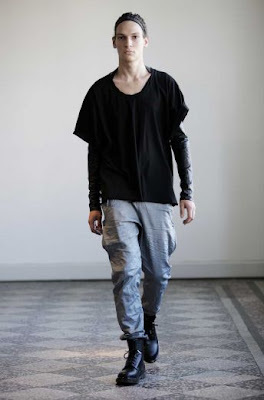 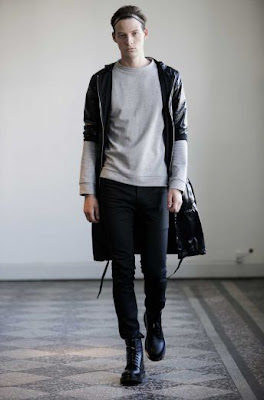 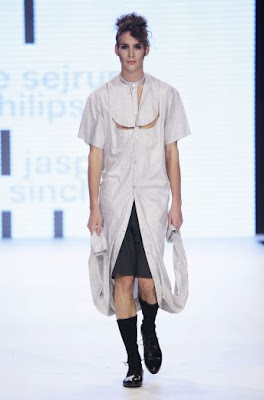 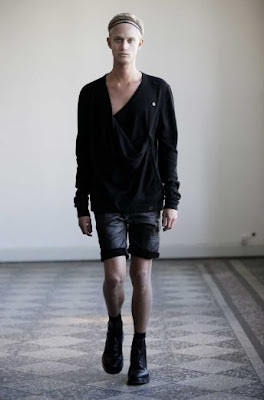 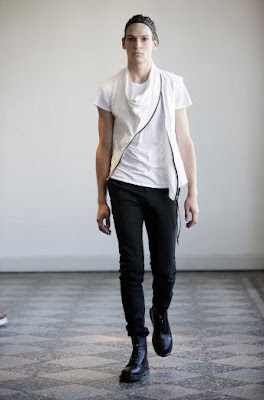 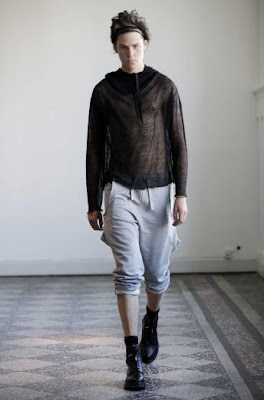 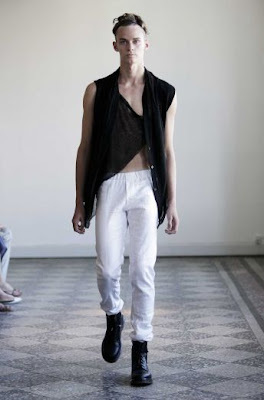 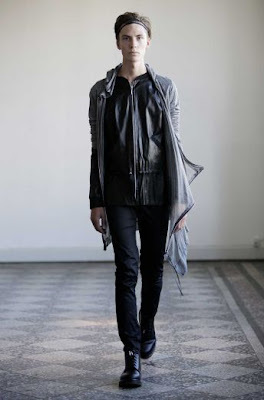 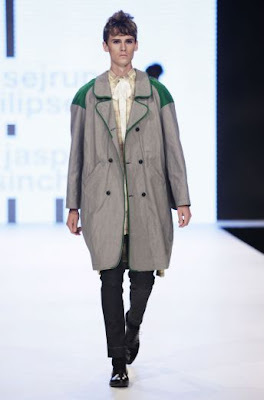 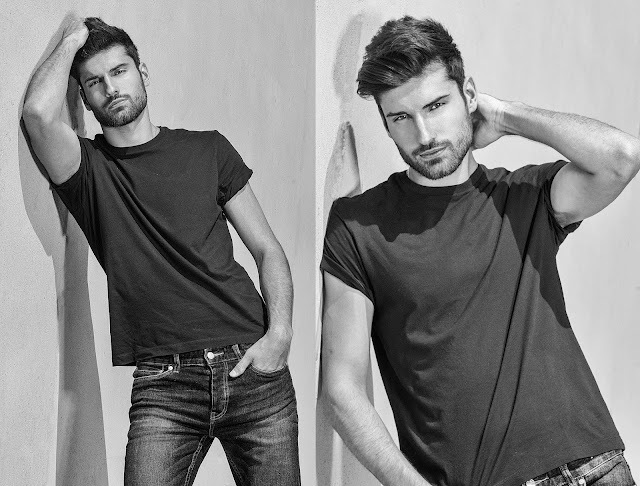 Jean//phillip an edgy and minimalistic fashion brand based in Copenhagen focuses mainly on couture menswear. 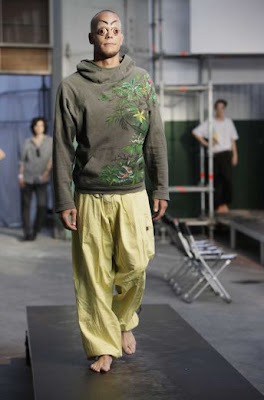 Showed a Moroccan inspired collection. 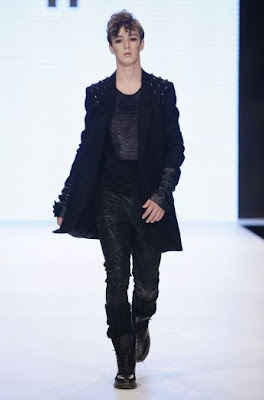 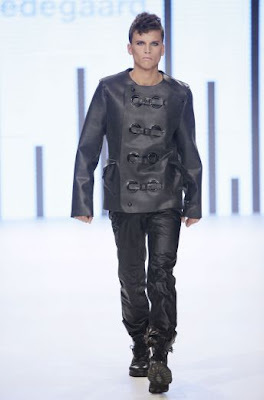 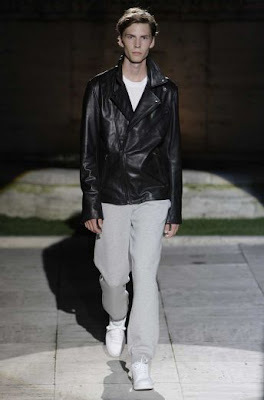 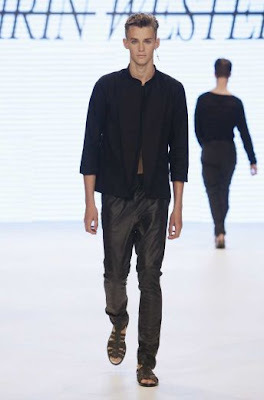 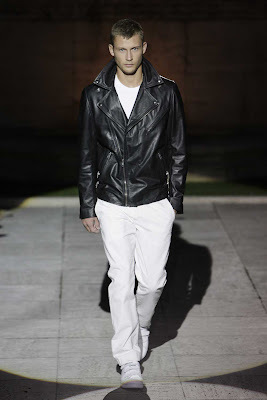 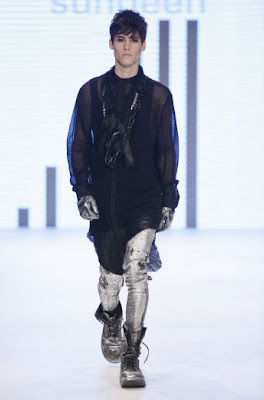 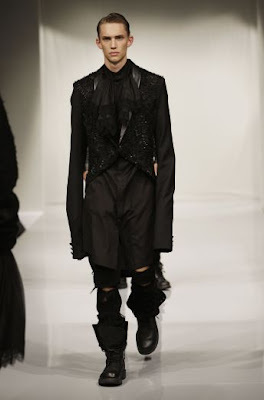 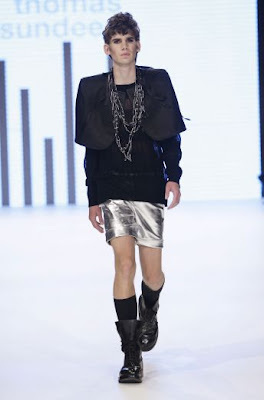 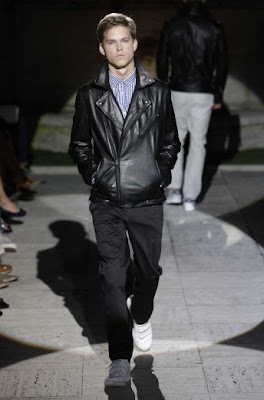 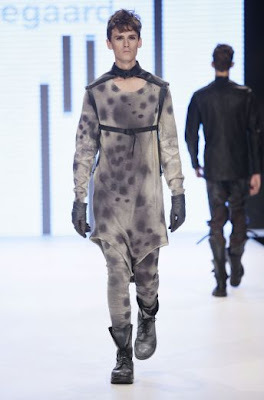 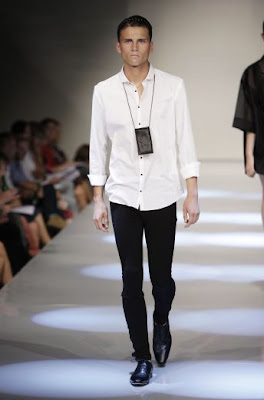 For spring/summer 2010 he offered monochrome dark colours in light transparent fabrics and leather. 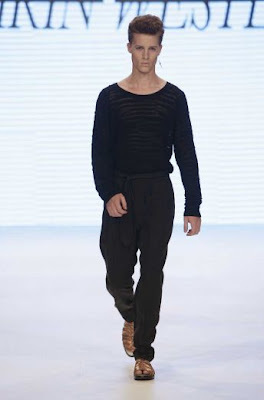 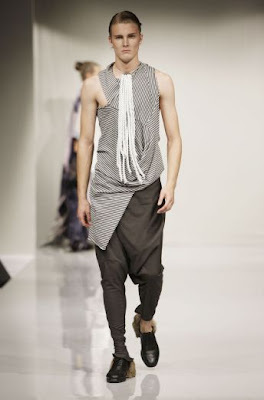 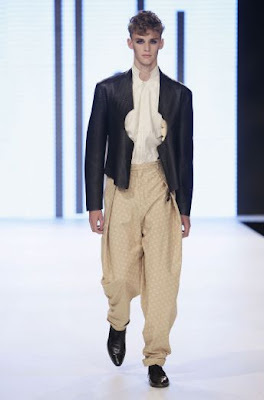 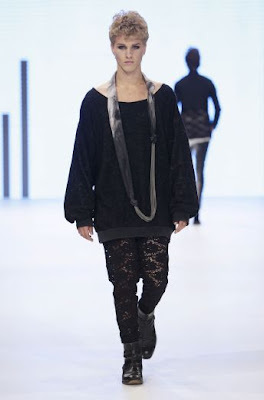 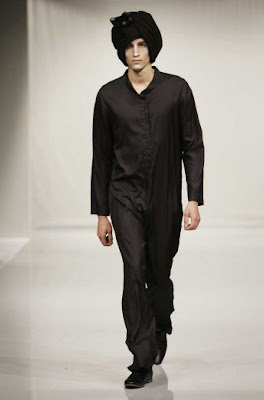 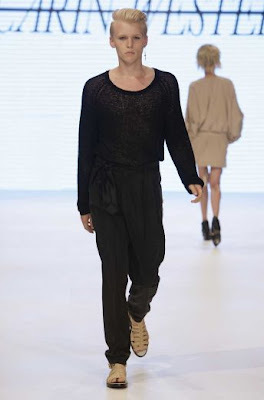 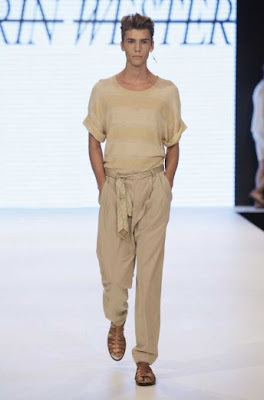 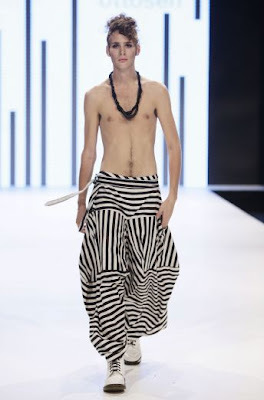 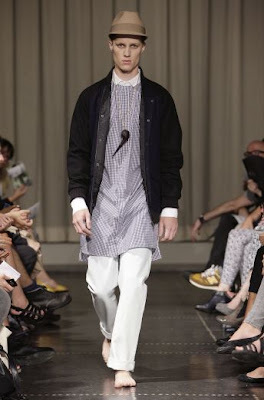 Marlene Marron also showed a Moroccan inspired collection- long strips kurta like shirts and black turban on men. 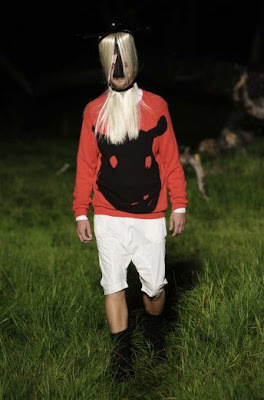 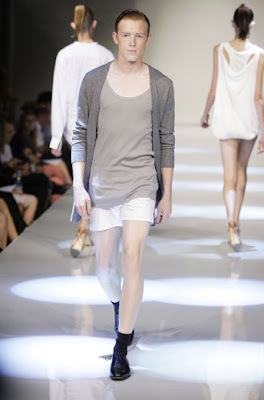 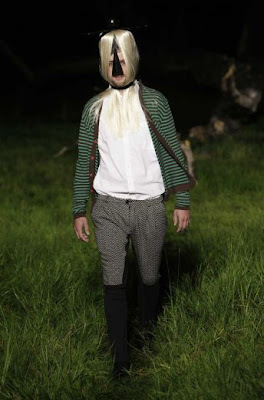 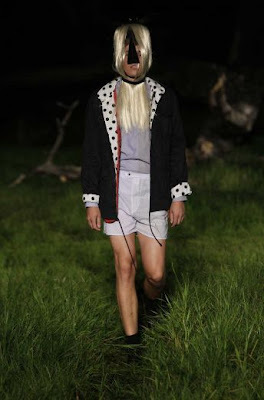 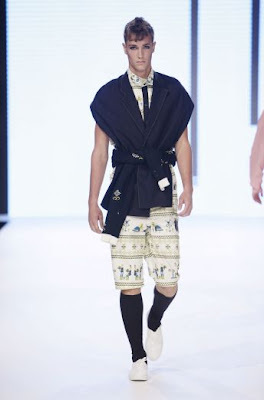 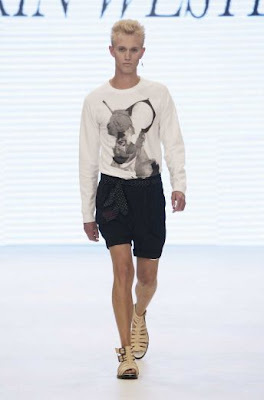 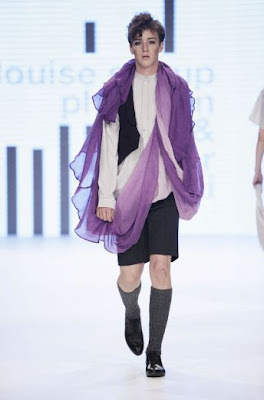 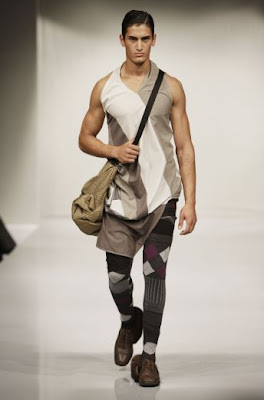 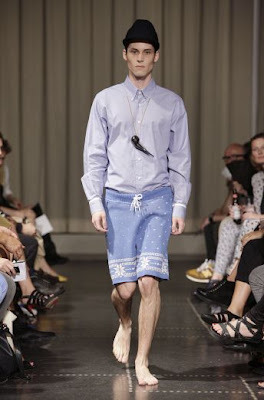 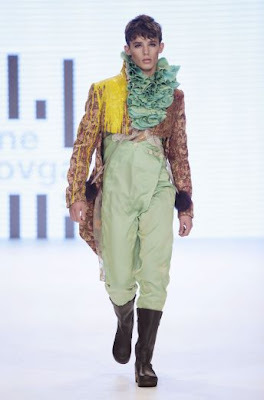 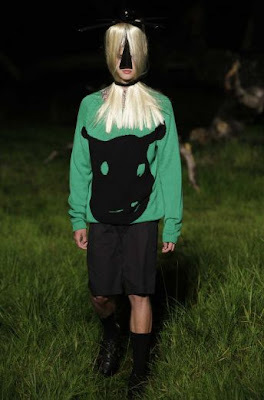 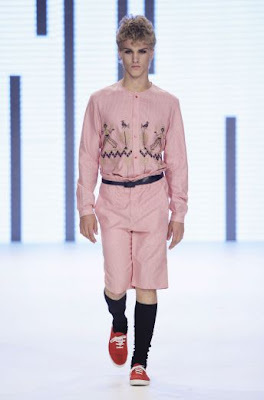 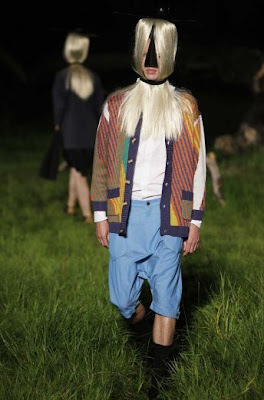 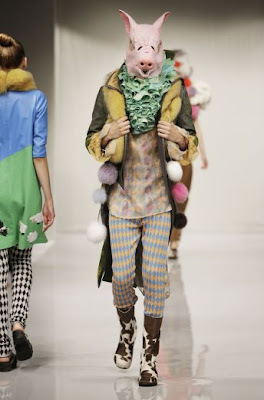 I love Henrik Vibskov colourful quirky horse inspired collection the T-shirt, shorts and cardigan are fun and beautiful. 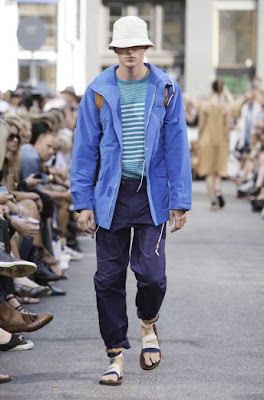 My main favourite is the Fifth Avenue Shoe Repair show. 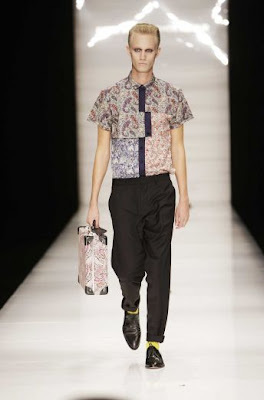 I love the mix and match of colourful paisley prints against black and gray pieces. 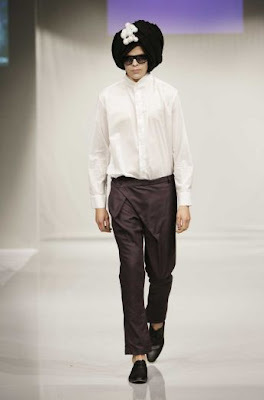 The relaxed silhouette is so wearable and unique cut of the pants and shirts are very interesting.